This is the first post since 2016.... Time to catch up with everyone. Hiya Moonie! I made it, whew! A camp fire sure would feel nice around now. It stopped raining finally but it's cold up here! So Moon, how is your garden growing? I have no idea what's going on in my yard - when I get home the sun goes in and it's not very warm out there.. and the weekends have been crappy. I took a walk around yesterday, oh boy... creeping charlie is in bloom. Hopefully this weekend will be fairly nice. Slowly but surely some things are coming back here are a couple pics. Fighting the darn weeds and it will be in the high 80's today....gotta get'em while it is cooler in the mornings. I may have something on JJ, I'll look at work. We went to my favorite nursery last night, DH needed cigarettes. I bought a pot of lavender. I noticed Angela always picks stuff with lavender in it, lotions etc.. so when it blooms I can pick some and make her a posey. My canna?? If you're giving I'll take. for sure! That's a pretty clematis, what cultivar is it? I bought 2 that were half dead last year (bogo) and it kind of looks like that. I forgot the name, I'll have to get my book o' tags out. Check out this link on making lavender scented bath goodies. I promised you an orange canna during the summer, but we were going to wait til fall...that was in 2013....not such a good year for memory.. There's lots of choices on that link. I have to reread some of Lynnie's stuff over there. I'm probably 15 lbs heavier than this time last year. Of course I smoked and couldn't breathe, either. So now I'm an easy-breathing roly-poly. (as long as I take my medicine, that is). It got so bad I got disgusted and joined weight watchers with Cutie (that's what we call DS's girl Katie). We shall see, I feel like a rabbit with all these salads & fruits & veggies. Oh! I looked, I don't have a phone number for JJ. I have an address..
Can I sit on a log by your fire? It's cold here today and we still have a lot of yesterday's hail on the ground. My plants are thrashed and a lot won't bloom this year. You certainly can Mary. Sometimes our fires are nothing but hot air, but even that can help warm you up. We have a "cold" front moving in Friday...rain for the next 5 days. Sorry about the plants...you have worked so hard this spring, it just doesn't seem fair. Smiley, I found my lost list. I am probably the one who tucked it away for safe keeping. I hear ya on the smoking...My last blood work and physical had my Dr grinning and I have a quit date set in stone. The theory behind the KPP diet : Eat a really good breakfast and eat til you are sated (eggs, toast ,cereal/oatmeal, juice, coffee/tea yoghurt and fruit. We even occasionally have bacon or ham). The real secret is to not skip a meal and to only eat (slowly) until you feel full. Drink lots of water and green tea sweetened with stevia. Watch out for diet drinks and No carbonated diet/regular sodas. Sometimes at supper, I am just not hungry, but on days like that, I make myself eat at least fruit and yoghurt or a salad. The calorie thing is important. The break down is roughly 400-500 at breakfast, 200 to 300 at lunch, 200 to 300 at supper plus under 200 for the dessert/snack reward. This works out to be 1000 to 1300 calories per day. Less than 600-800 per day throws your body into reserve mode...stores calories/fat rather than burning them and more than 1300 just sits there unless you are super active every day. Also, limit your salt intake as most prepared foods are high in sodium and that justs wreaks havoc on blood pressure and fluid retention. As for exercise, every time you move, even just doing laundry, cleaning, gardening etc, you burn a few calories. I added walking, at first to maintain my sanity, and then because I feel better and sleep better. All the info from my DR, Jim's diabetes nutrition info and reading say that we should aim for no less than 6 hours nor more than 8-9 hours of sleep at night. More or less confuses our internal clock and induces cortisol production which encourages the body to store fat. It has worked for me, and it makes me responsible and aware of what I am actually eating. That's what DH calls the farmers diet. His grandparents were dairy farmers in Kentucky, they would eat like that. Much more healthy. Lucky for me I don't drink soda pop, mostly just water. My problem would probably be that I don't drink enough of it, but I'm trying! I quit making coffee at work, I just bring a travel mug for in the car. I go right to the water cooler. With weight watchers, you are allowed so many points per day, according to your height, weight & age, and then there's a weekly hunk o' points in case you need them. Fruits and veggies are free, for the most part. There's a few that aren't. The points for food are based on calories. Carbs and sugar adds points, protein takes away points. They say to eat your allotted points every day to keep your metabolism going. My chiropractor is all over me (literally and figuratively ) about eating slowly. He's into holistics and vitamins and all things healthy and actually massages my stomach and intestines when I go there. He said my stomach was all bunched up (I eat fast) and to slow down and chew my food to a pulp. Swallowing rocks of food is tough on the stomach, and on the intestines as well. I try to make a conscious effort to do that, but sometimes forget.. I have skinny cow triple choco pops in my freezer! I love them! Hi Mary! Welcome to our camp! So sorry about your plants, if you find you're in need of something let us know. I have lots of stuff that needs dividing. By the way, I have an NOID daylily my SIL gave us that we divided. It has pretty purple blooms and is one of the meatier ones. The term escapes me - diploid and ?? ?? Have a great day, I'm off to do a little reading on the Kings of England. I'm up to Richard II (1377). Thanks for the offer of plants.... tetraploid (sp?) is the other term.... and I don't know what either one means. but We could have some fun making trades. Probably I would qualify as a modified health food nut. We eat breakfast out about once a week and have anything we want, then the rest of the week we alternate between an omelette with vegies in it, or cereal with fruit and nonfat Greek honey yogurt, sprinkled with sliced almonds, walnuts, or raw sunflower seeds. Or sometimes we have potato patties, or whole wheat pancakes with berry syrup or fresh fruit and yogurt. Lunch might be a sandwich or soup, or just leftovers because I still cook family size amounts. Cooking more at a time saves time and we like leftovers.... besides, cooking is not my favorite activity. If we go out to eat lunch or dinner, we try to keep our selections to healthy choices. The exception is a certain restaurant that serves the very best fish and chips.... We don't do the fast food thing. You may wonder why we go out for breakfast and not dinner... there are a couple of reasons. First, we are up early and like to get our shopping and errands done and then have the rest of the day free. Second... the earlier in the day the more economical it is! We live 22 miles from town so try to limit our trips. And retirement gives us flexibility! Ummm, that's four. I have a good source for organic produce since I work one morning a week at our local co-op and can bring home imperfect items. Among other things this week I got a cantaloupe that had been dropped on the floor, a small watermelon with a small bad spot, wrinkled tomatoes and romaine lettuce that had been replaced with fresher, better looking stock. Sometimes last week's stock looks fine until compared with the fresh stock. Bruised apples sometimes are just fine... just not saleable... and if they don't please us they do please my horse. There is a big difference between what people will buy and what is still edible. A garden supplies many things we don't buy. I do quite a bit of canning and freezing. My garden season is just about to really start. Baby squash and tomatoes are waiting until after the last sort of predictable frost date, peas are in the ground, berry bushes and grape vines coming out of winter sleep, onions are planted, and garlic was looking wonderful until we got hit with marble sized hail on Tuesday afternoon. Now it looks shredded and I hope for a decent crop from the 1,000+ cloves I planted last fall. My buyer is the co-op. It's interesting how different people choose to loose weight. Calorie counting, half portions, making breakfast big and other meals small, cutting back on treats, etc, and moving more. Winter is harder than summer, although I did get a fair amount of exercise shoveling snow last winter. I could loose about 15 pounds and never miss it. Gardening is my busy season, and sometimes I just grab a quick healthy snack and call it lunch. Again, thanks for letting me sit here and ramble on. Mary, you are always welcome to ramble here. I have enjoyed reading your posts since before you were helping with the lambing. Much as Sharon did, you have a real knack for putting the day to day into words and you do paint some lovely word pictures. I am so sorry about your garlic and peonies. I do hope the owls are okay. Sorry for your neighbors losing their crops. Mother Nature is still pretty unhappy it seems....floods, hail storms and freezes in May, rampant fires, tornados and heavy rains...Oh my. We are supposed to be caretakers, not destructive pillagers. Some folks just don't seem to understand that, nor take the message to heart. I too have plants to share. Not a lot is going to bloom this year as so much soil was washed away or buried things and I have lots of stuff sitting in rescue pots. Our group of gypsies is pretty good about sharing what we have with each other and you are welcome to list what you want/must replace. 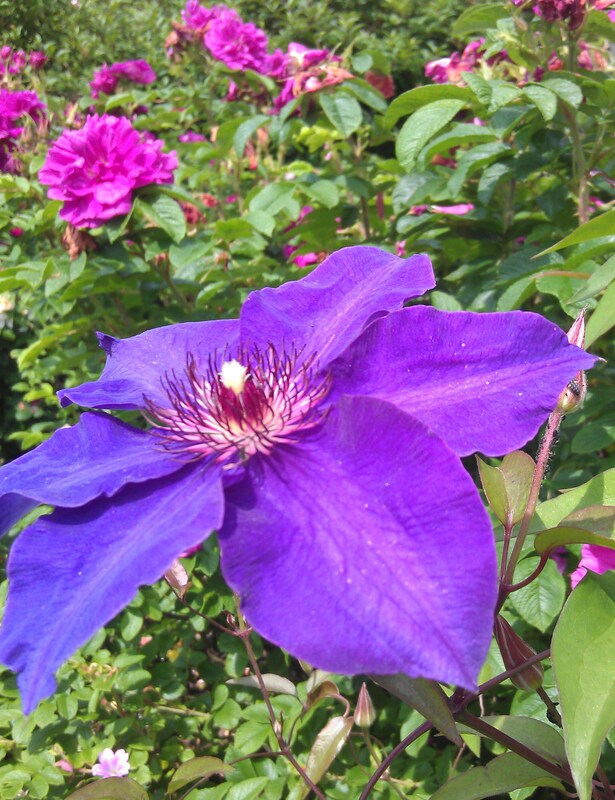 Smiley, you asked about the clematis...it was supposed to be Clematis roguchi The President But it was mislabeled. I am afraid I am not one to chase points and keep track of substitutions...I do okay once I know calories per serving of things I like (especially 'cuz I write it down in my food notebook) Yeah, i have one of those. Jim has Type 2 diabetes so he has all kinds of info laying around. Fortunately he does not require insulin injections, but is able to do diet and meds. Thank you, Jean. It's nice to be appreciated. I do enjoy writing. Sometimes the words and phrases just pop into my head, and at other times I struggle to describe something. When I was in high school English composition class we did an exercise where we each wrote a paragraph, then the teacher collected and redistributed them. We all rewrote another person's work, then the pages were collected again and again. Nobody knew whose work they were reworking. It was fun. Now I just rework my own messes. That is not as much fun. I'm glad that Jim's diabetes can be controlled with diet and meds. I can imagine how difficult that might have been when you had half the neighbors living in your house after the flood. You are most welcome Mary. Should you so desire, you are welcome to start a thread here...a Mary's Garden/Farm complete with voles, gophers and of course Patch and the owls. It can be as private or public as you like. My Dear Ms Smiley is our Tech Support here at the camp and has been wizard at setting things up. Even though she is at the top of the US in Buffalo and I am pretty much at the bottom, and we have never had the opportunity to actually meet face to face, we have been friends for what seems a lifetime. I know you will enjoy getting to know her also. My Senior Class song was from the play, Man of La Mancha. We were big time dreamers in the class of 1969. I do believe in looking toward the impossible and being able to see past obstacles, even if it only involves a single plant. Good afternoon! This seems to be the best time of the day for me to post. I found that posting at 6am doesn't work very well. So many comments I want to make, I'll never remember them all. Diploid and Tetraploid (thanks Mary!) - I remember reading on ATP about that, I believe it's the number of chromosomes ?? I can tell the difference - the dips are more graceful and slender with high placed flowers - reminds me of a ballerina. The tets are meatier, similar to myself. Moon coaxed me out of my shell way back on DG . I was trying to retreat and she asked me to come out & play. She's been one of my bestest friends, online or in person, ever since. Someday we will meet, Moon. It was really fun to set up this cubit. Moon, I think... (the ole' brain...) were you in Australia for part of the unveiling, or when it was in beta? I remember struggling with the banner, and playing with the colors. That's right up my alley. regarding the food thing - I just like food. Period. All kinds of food. Except liver. And I love to cook, that doesn't make it any easier to lose weight. I gained about 20 lbs in the process of quitting smoking, I would cook and bake to keep my hands busy. Ah well, hopefully I can lose that and some extra. Yup. Of that I am sure, Julie. I call DLs Pretty, Fancy and Prissy...I can never keep the proper terminology straight. I was gone for a part of the set up and Beta...trying to stay in touch with us being 16+ hours apart was interesting. I still love your banner...it is unique to the gypsies. Oy, the sun must be shining outside. We are so busy here at work! It's a good thing I don't have a window..
How are the aussie boys doing? They must be getting pretty darned big by now. It's been a while since I've seen a picture. I'd better get back to it, my cohort had to leave, she came in this morning practically in tears - yesterday her toilet overflowed and got a bunch of stuff wet. So I told her to go home and take care of her rugs. Poor Katie. Wet floors are such a pain. I found my lost list...JJ and I talked for over 3 hours last night. What cuties! Ethan favors your daughter.